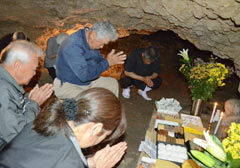 At Chibichiri-gama in Namihira, Yomitan on March 31, bereaved families prayed for those who died inside the cave by offering incense sticks at the altar. In the early stages of the Battle of Okinawa, on April 2, 1945, soon after the U.S. forces landed on the main island, an incident of group suicide (normally referred to in Japanese as shudan jiketsu in which the Japanese military ordered or drove civilians to commit suicide) occurred at Chibichiri- gama in Namihira, Yomitan Village. On March 31, family members of the 83 people who died held a memorial service at the gama, which means natural cave in the Okinawan dialect. About 20 of them gathered and prayed for the repose of the souls of those who died, pledging to strive to create peace. The family members made an offering of fruit and rice cakes at the altar, and lit incense sticks for the victims. Some shed tears as they pressed their hands together in prayer with their eyes closed. Seventy year-old Tokuichi Yonamine lost his grandmother and five of his siblings during the battle. After the war, his mother brought him to the gama, where he prayed.